Unique Index Card File Basket handwoven and designed to hold approximately 50 index cards or recipe cards in this folk art inspired basket. Woven of natural rattan reed with a hardwood oak basket handle, this basket features tiny flat oval basket weavers over flat reed base and uprights. The D-shaped basketry handle becomes an integral part of the base. 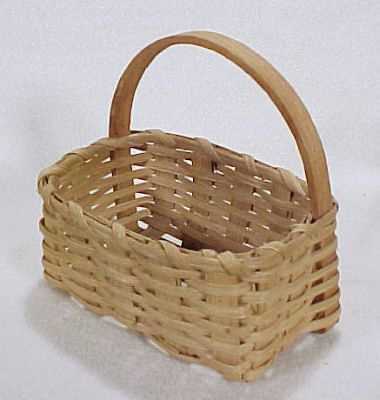 The small basket rims are lashed in flat reed and the basket has an open weave base. If you keep just a few index cards, or recipe cards stashed in your desk, then this is the basket for you. Organize your index cards or recipe cards on a desk or a counter where they're at your fingertips and ready to use. Teachers could use this basket on their desks to hold index cards, too, so it would make a nice teacher gift basket filled with multi-colored index cards. Signed and dated on the base by a basketweaver noted as "Lori" and dated 1989. There are a few very light stains on the bottom of the basket base as noted in the photos above.